S0630. 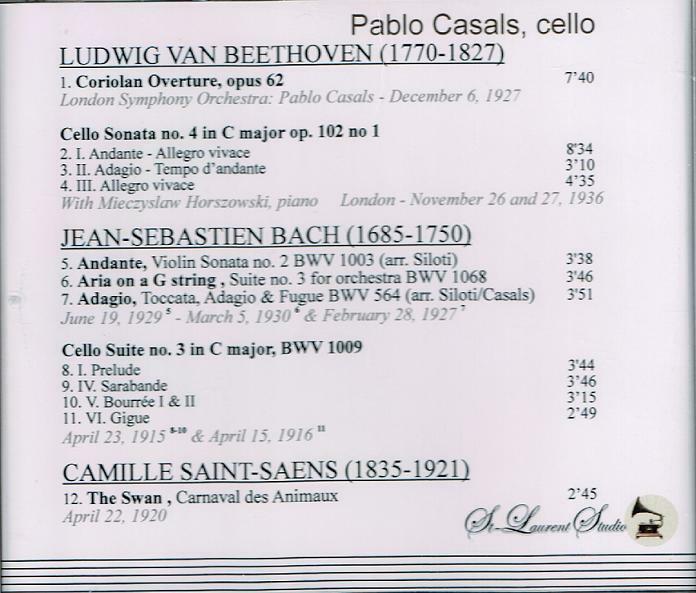 PABLO CASALS: Bach Recital; Le Carnaval des Animaux - Le Cygne (Saint-Saëns); w.Mieczslaw Horszowski: Cello Sonata #4 in C (Beethoven); w.Casals Cond.London S.O. : Coriolan Overture (Beethoven). (Canada) St Laurent Studio YSL 78-227, recorded 1915-36. Transfers by Yves St Laurent. “As the first modern cello virtuoso, Pablo Casals created a new appreciation of the instrument and its repertory when the concert stage was still considered the exclusive playground of the piano and violin. Casals also devoted his formidable musical skills to composition and conducting, leaving many insightful readings of the standard orchestral repertory to posterity via recordings. He is remembered today as much for his pacifism and regard for human life as for his musicianship (he once stated that ‘the life of a single child is worth more to me than all my music’). Casals came to his true instrument relatively late in life, having first developed some degree of skill on the piano, violin, and organ. Discovery of the cello at the age of 11 led to studies (from 1887 on) with J. Garcia at the Barcelona Municipal Music School. 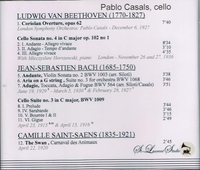 After a period of supporting himself playing in local cafés, Casals was granted a royal scholarship to the Madrid Conservatory in 1893, where he worked with Tomás Bretón, and later in Brussels in 1895. After a brief tenure as a cellist at the Folies-Marigny music hall in Paris, Casals returned to teach and perform in Barcelona, and joined the first of a series of notable chamber ensembles with which he would be associated: a piano trio with Belgian violinist Crickboom and well known pianist and composer Enrique Granados. 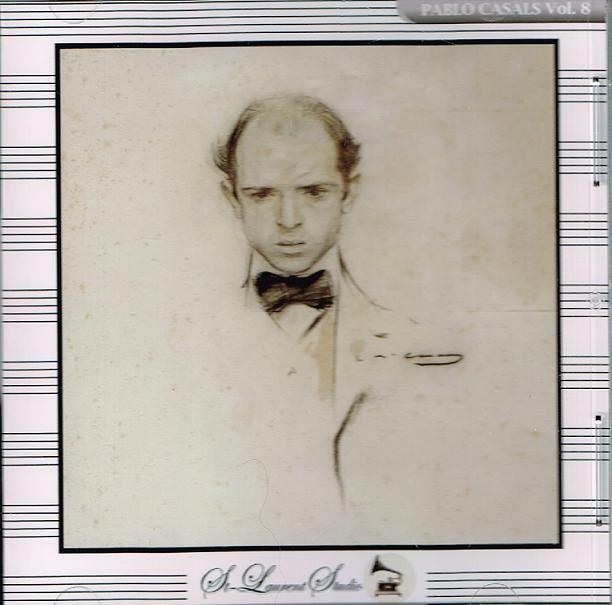 In 1919 Casals founded the Orquestra Pau Casals in Barcelona. Although the project was quite successful, the outbreak of civil war in 1936 forced its dissolution. Casals, who spoke out vehemently against the Franco regime, was forced to seek refuge in the Catalan village of Prades. Following the Second World War, saddened by the lack of any definitive action against the Franco regime by major world powers, Casals elected to cease performing as an act of protest. Inspired by the Bach bicentenary celebrations of 1950 at the first annual Prades Festival, Casals came out of retirement to begin a new series of recordings and concerts. In 1956 he made a new home in Puerto Rico, where he founded the Puerto Rico Festival. Though nearing 85, he began a campaign for peace in 1962, traveling around the world to conduct performances of his oratorio EL PESSEBRE (The Manger). Casals continued to make occasional concert appearances until virtually the end of his life in 1973.